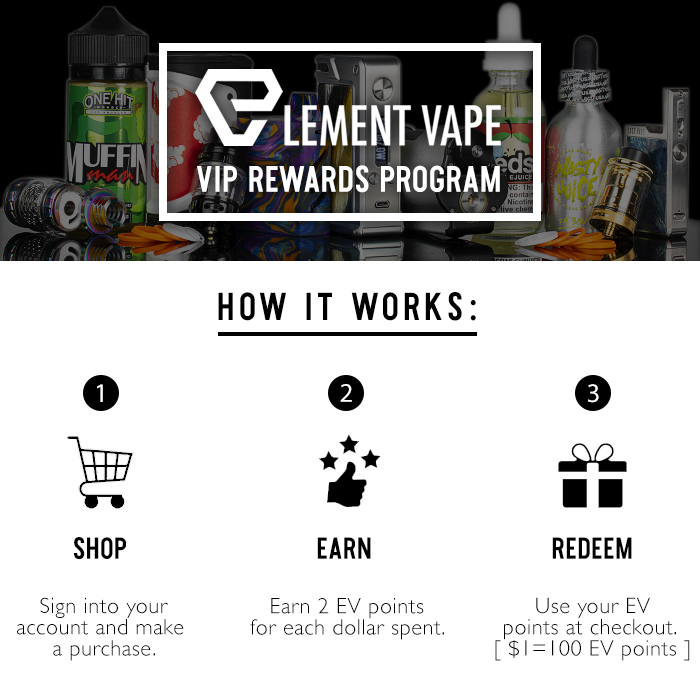 Be a part of Element Vape REWARDS Program and start earning 2% cash back in Reward Points on every order for SITEWIDE purchases! You can earn reward points for every purchase that you made at www.ElementVape.com and the points will never expire. The more you shop, the more points you can accummulate and save on future purchases! What is the conversion for Reward Points to cash value? For every $100 spent, you will receive 200 Reward Points. The 200 Reward Points are equivalent to $2 value. How do I keep track of my Reward Points? Log into your account and it should take you to the account page. The total points should be displayed next to “My Account” on top of the site. Before checking out your cart, please make sure to log into your account. During the checkout process, there will be an option to use your Reward Points. Please keep in mind that orders cannot be placed using all Reward Points so be sure to adjust so at least $1 is charged to a card during checkout. For the latest promotions and special deals, check out Element Vape's Coupon Page.